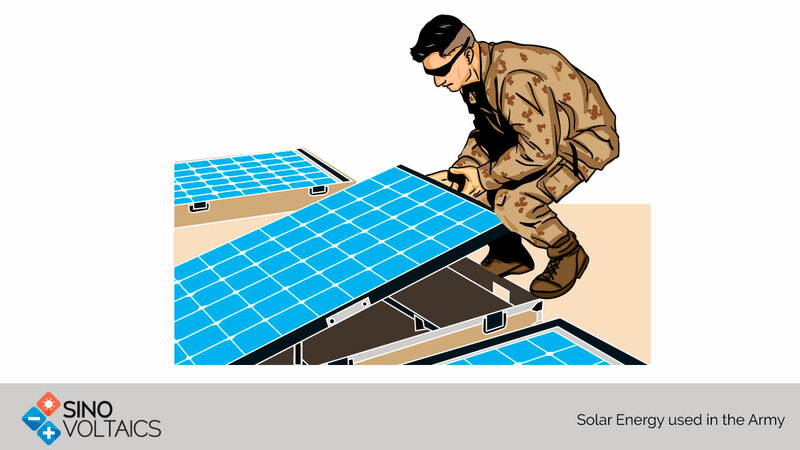 Alternate energy in general and solar energy in particular is very attractive for the military. It reduces their dependence on conventional fuel which has to be transported. They need fuel remote locations and are very often on the move. Under these circumstances solar energy, particularly photovoltaic energy looks very attractive as a partial replacement for fossil fuel. It certainly has the disadvantage of daily discontinuity, but if sufficient storage is made available, twenty four hour supply of essential loads can be arranged. Storage is costly, but storage and transport of fossil fuel is not cheap either. And of course, most countries have to import a smaller or a larger fraction of their oil and coal. Hence, solar energy is useful to the military from the economic as well self-sufficiency point of view. Solar energy is particularly useful for portable electronic devices. Most weapons these days have a measure of electronics in them, and need batteries. Batteries are inherently heavy. If man has to carry weight why not carry a small solar system enough to meet power demands during the sunny periods. With thin film PV coming of age, light weight folding panels will be possible, and could double as sun and rain shields also. Solar energy (and other green energy energy) is ‘clean’, and may help offset some of the dirty deeds of the militaries the world over. What are the American defense forces thinking and doing on this subject? (They have probably the maximum laundry to wash) This link will give quite a lot of details about the plans made in 2013. The US Army has announced the setting up a very large ‘lab’ in Michigan to apply new energy technologies to vehicles so that a Green Warrior Convoy can be launched. The three forces are also planning to convert one Gigawatt each of their power loads to renewable energy. In the case of the US Navy, 57 % of this will be solar PV followed by 25% geothermal. In the case of the Air Force, 71% will be PV followed by 12% wind. The Army will go for 58% PV followed by 20% biomass. This energy will be used in residential as well as operational sites and is likely to give a big boost to photovoltaic and other alternate energy technologies.